For centuries sheep have provided a great number of useful products beyond food. Wool, for example, has a host of uses including clothing, rugs, carpets, paint rollers, insulation and more. Hides are used for clothing, rugs, and leather products. Lanolin is a source of oil used in hand creams and lubricants. An article about the power of wool. This is a long article so it will take some time to load. Ignore the first page that asks for a name and email. Just click on the X in the upper right hand corner. Learn about the activities of the Michigan Fiber Cooperative. DENVER –Wool is the only fiber crafted for the purpose of meeting any purpose. With versatility matched only by the diversity of the wearer, wool is the perfect fiber for any season, any occasion. With that in mind, the American Sheep Industry Association and its American Wool Council have launched a multi-faceted campaign to take wool’s incredible story straight to the consumer, including a new website at AmericanWool.org. A new American Wool logo was launched in 2016 to kick off renewed promotional efforts. The website will work in conjunction with a variety of social media sites to tell American wool’s narrative in a multi-media fashion that includes stories, photos and video. One fiber, four seasons. Moisture wicking and protecting. Always breathable. Thermal comfort. Consumers can learn about these high-performance traits of American wool on an in-depth basis in a way that’s never before been compiled into one convenient location. Get started at Wool 101, which covers tips for the care of wool products, the types of wool, the science of wool and animal care. The types of wool section will get you up to date on each step in the process of creating wool garments. Learn about woolen and worsted garments and the difference between the two. Take a look at variety of wool fabrics, from 18.5 micron wool that would be used in base layers to 24.5 micron wool that is common in outerwear. American wool provides natural protection from the sun’s damaging ultraviolet rays, is anti-allergen, flame resistant and odor resistant. It is nature’s magic fiber, and AmericanWool.org will help those in search of such benefits find the perfect fit. A shopping section will link consumers with companies offering American wool products ranging from clothing to blankets. Whether you’re in need of that perfect hiking sock, a winter coat or a blanket for use around the campfire, AmericanWool.org has you covered. Michigan sheep shearer and producer, Jim Bristol, explains why shearing before lambing produces higher quality wool in this video. Shearing sheep in New Zealand is a vocation and a sport. This video is an excellent overview of this activity. The History of Wool – Ancestors of modern sheep had a double coat consisting of long hairy fibers, which served to protect and insulate the animals from the weather, and a soft downy undercoat, that gave additional insulation and was shed annually. The primary follicles of these primitive sheep produced the outer coat of hair. The secondary follicles produced the seasonal soft, fine undercoat. The undercoat grew during the warm months, was idle during the winter months, and was shed in the spring. Wool, as we know it, developed from this undercoat. Today sheep have a variety of fiber diameters from superfine to coarse. While remnants of these ancient breeds still exist, sheep have evolved into four distinct breed types: the “fine” wool type of African and Spanish origin; the “medium” wool type and the “long” wool type, both of European and English origin; and the “carpet” wool type, mostly of Asiatic origin. In modern sheep the primary fibers have been reduced in size and numbers, the density of secondary fibers have increased, and the seasonal effects of growth reduced, eliminating shedding. The result is a relatively uniform coat of wool fibers. The Follicles – Wool fibers are outgrowths of the skin; the follicle is an indentation of the skin’s outer layer. Basically, the follicle consists of a bulb down deep and a shaft leading from the bulb up to the skin surface. The fiber originates in the bulb and is pushed up the shaft, where it undergoes elongation and hardening or keratinization. From two types of follicles, the primary and secondary, three types of fibers are produced: true wool, medulated, and kemp. The larger primary follicles produce wool fibers, as well as being the normal source of medulated fibers and kemp. The primary follicle is unique as it has a sweat gland, a sebaceous or grease gland, and an erector muscle. The sebaceous gland coats each fiber with a greasy secretion before it reaches the skin surface. This greasy secretion also keeps the skin soft and protects both the skin and the fiber from drying out. The sweat gland secretes a soapy perspiration called suint, which combines with the grease to produce the yellow colored yolk. When the erector muscle contracts, the outer coat hairs stand up to trap the air, this causes pressure on the sebaceous gland releasing the suint. One primary follicle is capable of producing only one fiber. In contrast, the smaller but more numerous secondary follicles grow only wool fibers and lack the sweat gland and erector muscle. One secondary follicle can produce up to eight wool fibers. The secondary-primary ratio is the number of secondary follicles for each primary follicle, and varies by breed, i.e. 20:1 in a merino but only a 5.5:1 ratio in a Romney. This ratio can be a useful indicator of the quality, density and fineness of wool production in sheep. Wool is often called the Miracle Fiber that is thousands of years old. One of its miracles is how the individual fine fibers can be felted into a solid fabric. That fabric can be soft and drape like a scarf or shawl. It can also be firm and dense enough for water droplets to stand on its surface. A legend claims that the secret of feltmaking was discovered by Nomadic tribes in Central Asia when the men packed their sandals with wool to cushion their feet during their long wanderings. The movement of their walking and sweat turned the wool into felt. Feltmaking evolved into a mainstay of their lives, used for clothing, rugs and tents. The tents, called yurts or ger, are popular today for tourist to rent in many Asian countries. Felting is the manipulation of fibers to tangle and compress them into a solid piece, this can be done by hand or by machine. 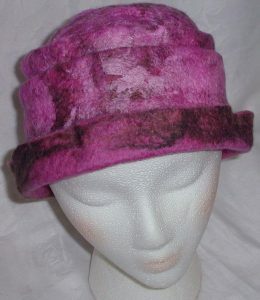 One method called Wet Felting, using water, a small amount of soap and agitation by rubbing or rolling layers of wool. There can be various techniques to achieve felt this way. The technique that works best for me is to place layers of wool on a plastic sheet, dampen the wool with room temperature water that has enough soap mixed in to make the water feel slick. The amount of layers depends on what I intend to make. If a soft, drapey scarf is the goal, only 1 or 2 thin layers of wool may be used. If it is going to be a pillow or chair covering there would be at least 4 layers of wool. The wool I use has been cleaned and processed into “roving” where the fibers are in random directions. Another form of wool that I use is called “top”, the roving has been combed so that the fibers are aligned all in the same direction. When roving is used for wet felting, the layers can be laid in the same direction. When using top, the layers alternate in direction to allow them to tangle more easily. Once the fibers are laid out in layers and wet, I cover them with another sheet of plastic making a “sandwich” which can be rolled or rubbed to create a flat piece of felt. This basic technique can be modified slightly by adding a pattern called a “resist” to create 3 dimensional pieces like mittens, hat or a vessel. A form of wet felting is called Nuno Felting. The technique is the same except a sheer silk fabric is added in place of a layer of wool. The fibers can completely cover the fabric or be used as design for the fabric. The layers of wool used depend on how heavy or light you wish the final scarf or coat. The wool actually felts through the fabric. Another method of felting wool is called Needle Felting. This method began in industry where machines hold thousands of needles to make felt used for construction material, insulation from heat or cold and also for sound as in large sound system speakers. Oil spills are absorbed with this type of felt. An inventive person used just one of these needles to produce felt craft items. This is a popular form of felting for many because it uses only the wool and needle, no water is needed. Small hand tools have been designed to hold multiple needles allowing the artist to form 2 or 3 dimensional items such as animals or felt art pictures. The needles are approximately 3 inches long and look like an Allen Wrench with cuts in the stem called “barbs”. When the needles are poked into layers of wool the barbs cause the fibers to tangle. With repeated poking felt can be dense enough for sculpture or making jewelry beads as well as making flat felt. A third method of felting, Knit then Felt or Crochet then Felt, is made using the household washing machine. The item is first knit or crocheted with larger than normal stitches to make it approximately a third larger than the finished piece. It is then agitated in the washing machine, stopping the machine frequently to shape by hand until the desired shrinkage is reached. The unique qualities of wool; flame, water and soil resistant, insulating for cold and heat plus being a renewable resource make wool most desirable for clothing, accessories and home décor items. Wool is an easy product to work with, ideal for the craftsman and artist, beginner or professional.